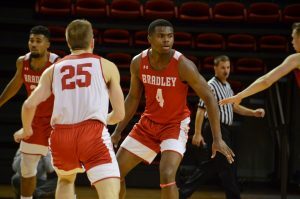 Fouls, technicals and missed free throws marred an instant classic in an overtime thriller for Interstate 74 rivals Illinois State and Bradley. Illinois State overcame a late charge from the Missouri Valley Conference’s leading scorer, senior Andrew Warren, to secure their second victory in a row, 79-78. Warren scored 25 points to lead all scorers and ISU’s Jackie Carmichael had 24 points and 17 rebounds off the bench. The rivalry’s intensity heated up quickly as the Braves roared off to a 23-8 lead in the first ten minutes. But foul trouble did the Braves in and let the Redbirds back into the contest before the end of the half. At the start of the second half, Bradley once again had a good start and pulled away to an 11-point lead with nine minutes to go before foul trouble and turnovers did them in. At the end of the game, ISU took the lead for the first time all game with 13 seconds left in regulation and held on dearly to a two-point lead with four seconds left. As the Braves inbounded the ball for what seemed like the last play of the game, the clock malfunctioned and gave the Braves a pseudo timeout. The Braves got the ball to junior Will Egolf and he drew a foul and went to the line. After making both free throws, the game headed to overtime. Overtime was a tale of two players, ISU’s Austin Hill and Warren, who entered the extra frame with two and 14 points, respectively. 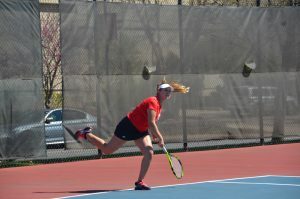 Hill scored the Redbirds’ first four points and ten of 14 overall. But after almost every Hill basket, Warren answered. With this win, ISU moves to 2-8 in the MVC and Bradley drops to 0-10. 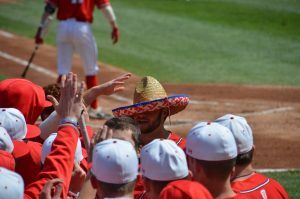 Bradley plays Saturday against Wichita State at 1 p.m. on ESPN2.